This picture is interesting because the colors and design make it seem like there are arrows going up, but depending on how you look at it, you can see arrows going down as well. 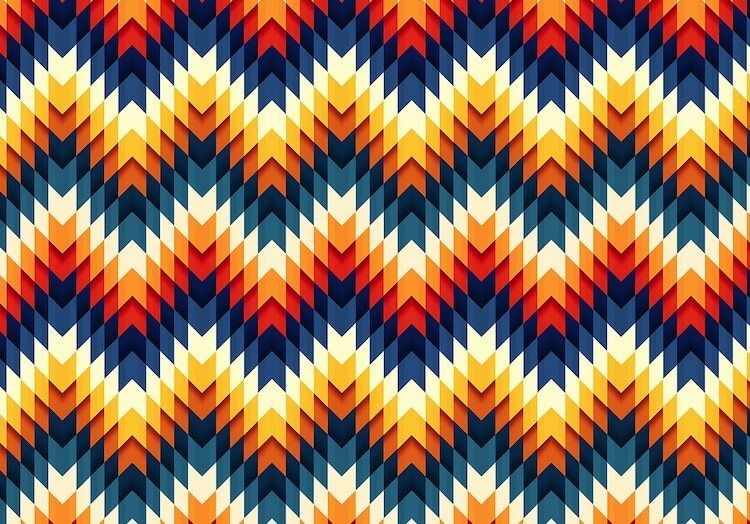 The colors in this pattern image are either warm or cold. The reds in this image are bold, and help them stand out more than the blues. The blues in this image are darker and make it seem not as noticeable as the reds. This makes the blues be more diminished and not as important and disappear in the image. In the same sense, the blues in this image are used to intensify the reds and oranges. This image uses eleven different colors in it in a repeating pattern but from a distance you cannot tell how many colors there are. There are different temperatures of reds and blues in this image. The image uses a warmer red to have orange and also has a colder blue to create a dark blue. Half of the colors in this image are more saturated than the other half. They have a darker tone to them and separate them from the other colors. The colors are a mix of analogous and complementary. For example, Blue and orange are used and they are complementary but red and light blue are not complementary but rather analogous on the color wheel. There is no negative space in the image, unless you consider the white the negative space and all colors space filled in. It does not play a role in the overall image because the overall image is a repeating pattern and so all the colors work together.